One of the real pleasures of life in Vermont is the tradition of horses. Horses have been part of Vermont life, as a means of transportation, to haul timber, plow fields, pull stumps and carry heavy loads since the 1600’s. Today, most horses are relieved of the heaviest of work activities, but Vermonters are very attached to traditional ways, and it is still possible to find horses being used on farms, in logging operations and, of course, as transportation around the state. The Morgan horse is the official state animal, a strong, compact horse well suited to the Vermont weather and a dependable carriage and riding horse. Any time of year, you can find opportunities to ride, work with or just watch horses in action. Carriage driving and sleigh rides are popular activities on rural Vermont backroads and many Vermonters love, own, breed, ride and show horses. The Green Mountain Horse Association (GMHA), just 7 miles north of the 1815 House on Route 106, is the region’s premier equine education, show and recreational facility. Located in picturesque South Woodstock, GMHA provides a wide range of riding, dressage, jumping and carriage driving clinics throughout the summer and fall, hosts numerous competitions and offers the best horse trail riding around on it’s vast network of trails. In fact, GMHA has worked hard with local landowners and has developed the largest network of riding trails in New England, including 70 miles of permanently marked trails open to members and hundreds of miles of trails on private lands available to members by permission. All summer long and well into the fall, GMHA hosts horse camps for kids and clinics for adult riders in everything equine. There are events and competitions almost every weekend. While you may not have thought of horseback riding as a spectator sport, you have an excellent opportunity during your stay at the 1815 House to watch impressive jumping, carriage driving and dressage events just up the road. You are welcome to drop by to watch the competitions and learn more about this what goes on at this popular facility. Before moving to Vermont, I had no knowledge of carriage driving. But it is very popular and you can find people enjoying a carriage ride along the many roads in our neighboring hills, as well as watching carriage driving competitions at the events at GMHA. Dressage, which is the art of training and controlling both horse and rider as a unit to develop their skill, grace and performance is a major focus of the competitive events. The hunter/jumper events are my personal favorites…to watch the horse and rider glide over the course and clear some pretty festive obstacles with speed and precision. The carriage driving gets surprisingly competitive, as well, in a good-natured sort of way! GMHA’s facilities, covering 65 acres, includes permanent stabling for approximately 160 horses in six barns, and additional temporary stalls available for select events to enable a total of 196 horses to stable on the grounds. They have four event and training rings, numerous grass riding areas and a cross country course that includes a number of interesting jumps. In 2015, they purchased the Rush Meadow Ring, just around the bend from the 1815 House, which is a 5.6 acre parcel of land with a large grass arena and serves as trail head for two of the member loop trails. GMHA does not own any horses. Members and participants bring their own horses with them to participate in clinics, trail rides and competitions. Those without their own horse sometimes make arrangements with the stable owners where they train to use their horses. I asked about riding lessons or opportunities for 1815 House guests to go on a trail ride. GMHA, since they do not own horses, does not offer traditional lessons or provide horses for trail riding. However, there are private stables nearby that can provide lessons or trail riding opportunities. If you are interested in riding during your stay at the 1815 House, let me know and I will help make arrangements for you–the best way to see the Green Mountain State is definitely on horseback! Horses can be seen everywhere in Vermont, being ridden along a country road, grazing in the fields and even plowing fields and working on mountain slopes . Loggers and public utility workers sometimes use horses preferentially to vehicles because the horses can keep their footing in places where trucks cannot even go. The utility worker in the photo to the right is using his horse to pull fiber optic cable. July 9th, 2016: Celebrate GMHA’s 90th Birthday Party. They will be hosting an open house, including hay rides, demonstrations, horses to pet, birthday cake and general merry making for all. Open to the public; noon to 4pm; free. August 19th, 2016: Derby Day and Tailgating Party. Bring your friends, food, favorite beverages and park ringside to watch some great jumping on the derby course. When the horses finish, the course will go to the dogs! with the annual Doggie Derby. Noon to 7pm or later. Open to all. Just 13 miles north of the 1815 House, you’ll find the quaint village of Woodstock. Now I’m not at all attracted to “cute” places, but Woodstock surpasses that moniker and settles firmly on the realm of “quintessential New England Village” in all its glory. The village center is large enough to host an interesting variety without being so large that you cannot comfortably stroll through it. Settled along the picturesque Ottauquechee River by a number of extremely colorful characters in the 18th century, it became (and remains) a showpiece of architectural styles fashionable over the last two centuries. The main streets are home to a variety of local Vermont products, traditional shops, and galleries displaying art and crafts from local artisans (some of whom have become quite well known). 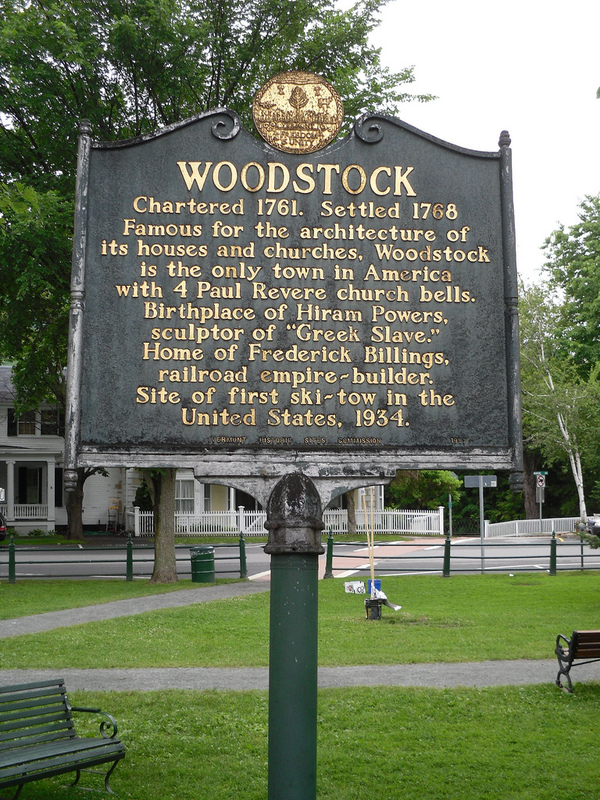 I recommend taking a simple walking tour of Woodstock, starting at the Village Green where the historical marker shown at the left provides a nice introduction. About mid-point on the north side of the green, there’s a side road that will take you across the river through a lovely covered bridge. Have a peek at that, the view from mid-span is worth checking out. Today, I’m not leading you to the other side of the bridge–there’s a lot over there, but that’s for another blogpost! Today, we’re just taking an easy stroll around the village. Walk down to the west end of the green. Straight ahead of you will be St. John’s Episcopal Church. Really a nice old stone building. And on your right is the old Town Hall. This is worth noting for later. The auditorium has been upgraded with a great sound system and comfortable seats. The local arts foundation, Pentangle for the Arts, holds a variety of events here…movies, concerts and theater. Check the schedule that will be posted out front. Maybe you’ll want to come back tonight for a show? Now walk back through the green toward the commercial section of town. On your right you will see the Woodstock Inn, a courthouse, and then the Library. What a wonderful public library! There are a lot of small well appointed libraries in villages all over Vermont (we have a very nice one in Felchville), due to generous contributions from local businessmen who valued public access to information. The Woodstock library was built in 1883-4 by the son of Norman Williams as a gift to the town and has been very popular since the day it opened. Go inside if you have time and just walk around. For such a small town, this is a magnificent space and a great resource. And wow! it’s beautiful! I promise you’ll be impressed. Continue walking east into the heart of Woodstock and you will find yourself at the corner of Central and Elm. For a couple of blocks in any direction, you will find a host of lively and whimsical shops that sell…oh, really anything! There are art galleries and jewelry stores, fashion boutiques and crafts stores, but I’d like to draw your attention to a few of them that really define the local culture and that have been establishments in Woodstock for…generations, I’d guess. Turn up Elm Street. On your left you will find Gillingham’s…officially, F. H. Gillingham & Son’s General Store. Go inside and browse around and see if you can get out without finding something that you really need. It’s harder than it sounds. They have wonderful stuff and lots of it. Pure entertainment. Next door at the Village Butcher you can pick up an excellent deli sandwich, then walk two doors down and along the driveway to the spacious grounds along the river behind the historical society where you can enjoy your picnic lunch. Back on Central Street, you’ll find shops that will intrigue pretty much everyone…even your grumpy uncle…buy him a homemade ice cream cone at the Creamery…that’ll cheer him up. Stop in at the Woodstock Pharmacy for a bit of nostalgia, and at the Vermont Flannel Company for…you guessed it…all things flannel. You’ll find interesting bookstores selling tomes by local authors, handmade fudge and locally crafted pewter ware, pottery and textiles. You don’t have to buy anything, but it’s fun to look. From 3 to 6 pm on Wednesdays in the summer and fall (June 1-October 12), the Chamber of Commerce sponsors a very nice farmer’s Market on the Green. It’s worth a look, so get back to the Green before 6 if it’s a Wednesday. Vendors compete to be included in this market, so it’s probably the best farmers market in the area. There’s a nice variety of local organic produce, including a good selection of heirloom produce and items that can’t be found elsewhere. There are also local cheese producers, bakers offering breads and pastries and artisans offering craft items and other consumables. Like at Gillingham’s, it’s rare that I get out of there without finding something delectable for the evening happy hour. I hope you enjoy your stroll through Woodstock and that this guide has given you some good ideas. Now you know some things to do in Woodstock Vermont!